TheHorrorDome.com Scary Halloween Costume Giveaway Winner: Congratulations to Kyle H. of Levelland, TX, winner of the TheHorrorDome.com Scary Halloween Costume. Thanks to all entrants, and be sure to check the Dude homepage or Dude Giveaways section for your chance to enter our latest prize drawing. This giveaway concluded on October 15, 2017. Halloween is on its way, and we've got your tricks and your treats all rolled into one tidy (well, except for those dangling intestines...) package. Click here and enter to win your choice of one of three horrifically gory, horrifically nightmarish, horrifically sick-to-the-last-entrail Halloween costumes from TheHorrorDome.com! Up to a $320 value! TheHorrorDome.com. The name says it all. Enter their sphere and welcome the fear. 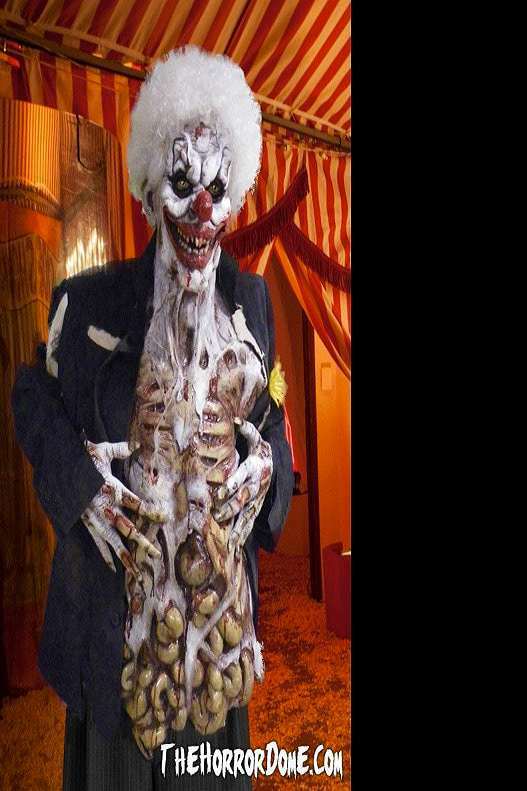 All TheHorrorDome.com costumes thrive on the disturbing, the occult, the bizarre--the haunted house you wish you hadn't agreed to enter. For this giveaway they're offering up our winner's choice of one of the following delightfully disgusting ensembles. Last Laugh the Zombie Clown. What does the undead cow eat? GRAAAIIINNNSSS! Yuk, yuk, yuk. The hilarity never stops and the hunger never wanes when this guy's around. 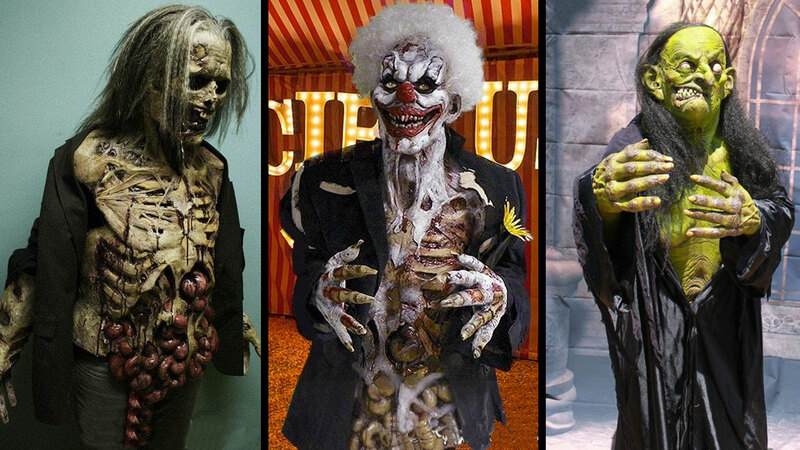 When everyone else shows up as Pennywise, you'll get the Last Laugh, an ultra-realistic hand-painted and hand-haired circus zombie that includes a movie quality gore mask and attached gore chest, and movie quality rotted clown hands. Jacket and fresh juggling organs not included. The Zombie Lurker. This fella's a wallflower. Kinda shy. He waits for you to approach him before cracking open your coconut and slurping out the brains. The costume has been hand painted and hand haired by people with an inordinate amount of patience for tasks as tedious as their results are horrific. It comes with a studio quality chest and attached mask, plus studio quality zombie hands. Helga the Witch. Who needs a gingerbread house to lure Hansel and Gretel into your lair when you're as fetching and charming as this little lady? Helga the Witch is a hand-painted TheHorrorDome.com original. It's a full body costume made to Hollywood quality standards, right down to the pair of Gangrene Green gauntlets. To register, click here and fill out TheHorrorDome.com Halloween Costume Giveaway entry form. Or, if you're already a member of DudeIWantThat.com, when the magic entry form button appears, just click it to enter. Giveaway prize includes winner's choice of 1 costume from the following 3 options: Last Laugh the Zombie Clown ($299.99); The Zombie Lurker ($299.99); and Helga the Witch ($319.99). Winner should allow up to 2 weeks for prize delivery, but will receive the costume by Halloween. Once winners are drawn and confirmed, they will be announced below. 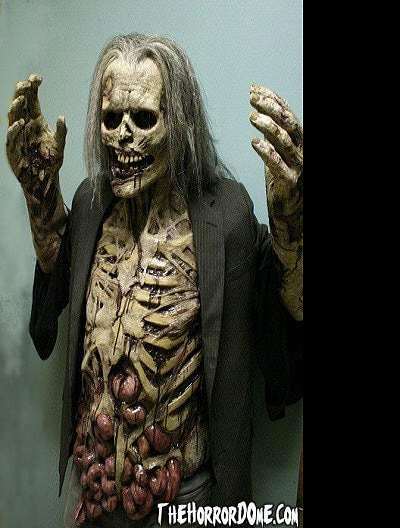 You're just a few clicks away, not only from grabbing your own Last Laugh, Zombie Walker, or Zombie Lurker, but any one of dozens of TheHorrorDome.com expertly crafted and terrifically sinister Halloween costumes. Choose from an array of themes, styles, and prices. Like: Alien Mind Control, which you might have seen around here in the past; or The Infected Zombie, who looks like an even more evil and grotesque Farouk the Shadow King. 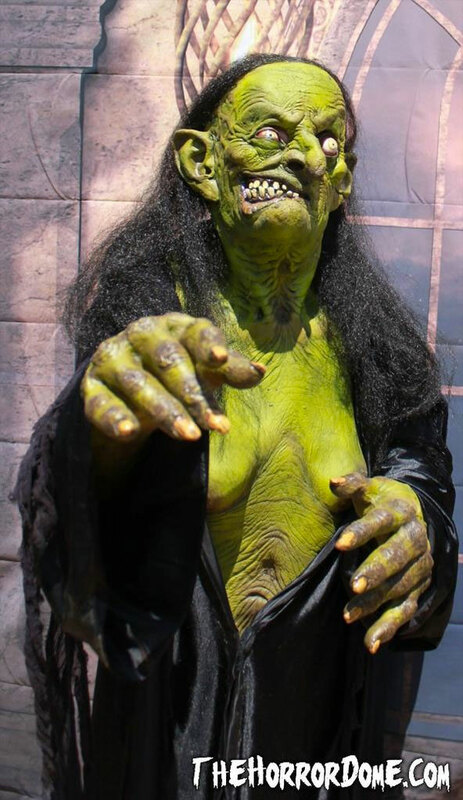 TheHorrorDome.com is also your go(re)-to source for Halloween party and haunted house props, decorations, and animatronics.